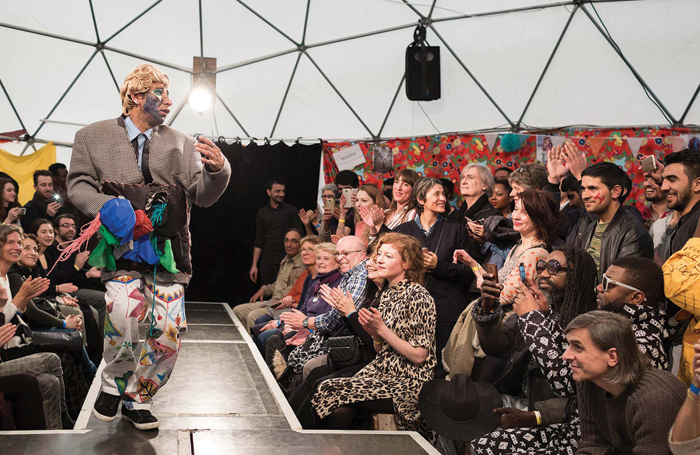 Fashion shows are among the events put on by Good Chance in its three Paris pop-up theatres. The Jungle, a critically acclaimed play about the Calais refugee camp that premiered last year at the Young Vic, has recently confirmed its West End transfer. Yet, just a short hop across the Channel the refugee crisis it dramatises rages on – along with the good work that theatre continues to do there. Joe Murphy and Joe Robertson, the writers of The Jungle, were inspired by their own experiences at the Calais camp, where they set up the Good Chance Theatre for its inhabitants. I saw the organisation’s positive impact first-hand this month, when I visited Paris to volunteer with them for a week. The Jungle features refugee actors who ‘the Joes’ – as they are known – met in the Calais settlement. The production reinvigorated the discussion around the crisis and some people told me they’d been moved to become volunteers after seeing it. Good Chance Theatre is among many charities continuing to work with refugees in Europe, amid an increasingly difficult fundraising climate. While the Calais camp, the play’s setting, was dismantled more than a year ago, hundreds of migrants remain in France, and a recent count by volunteers found 3,000 refugees – the actual number is thought to be much higher – sleeping on the freezing streets of Paris. Good Chance moved to France’s capital to provide a safe space of expression for refugees living on the streets, setting up a temporary theatre for five weeks in Chapelle in the northern part of the city in March 2017. I saw its operations first hand while researching another article, and what I experienced in just one day shook my world view, making me determined to return and volunteer. The organisation has now set up its third, dome-shaped, pop-up theatre in France, this time for 10-weeks, within the grounds of the capital’s largest refugee welcome centre La Bulle, also in Chapelle. Good Chance has partnered with charity Emmaus Solidarite, which runs the centre where refugees go to begin the asylum process. The Paris activities of Good Chance are overseen by project manager Emily Webb, supported by executive director Naomi Webb, while artistically the venue is programmed by guest curators who each stay for three-week periods. Previously the Joes were responsible for the domes’ programming. They, and those with them, believe that theatre can help rebuild the (often-shattered) confidence of refugees, and provide a means for cultural integration. The Joes argue that providing a safe space for freedom of expression and empowerment is a fundamental human need after food and shelter. As volunteers, we were expected to be present for a minimum of a week, working towards a Hope Show – a public sharing of the work – each Saturday. Volunteers stay for between one and 10 weeks. One told me that the experience had motivated her to quit her corporate role in the City and stay on at the theatre. My first job was to welcome people from the centre into the dome. I tried hard to explain what Good Chance was to them, resorting to mime when the language barrier proved insurmountable. Most of the refugees I encountered were young men from Afghanistan, though there were some from Iraq, Somalia, and Eritrea. I heard countless stories of the horrors they suffered in their home countries, and the heartbreaking tales of their journeys through Europe. Many had been subject to police brutality, false imprisonment, and hostility from the public. The theatre’s activities – on my first day – started with a trust exercise, which involved pairs guiding each other around the dome. One young man’s face lit up at this, saying he was “so happy” to be involved. This 11 sq metre space, under the main dome, is used for movement and theatre workshops. It is attached to a smaller dome used for arts and crafts activities. As well as setting up the space and welcoming people, volunteers participate in the workshops, bringing as much energy and creativity as they can. Throughout the week I leapt out of my comfort zone with activities that included vigorous breakdance and movement workshops run by choreographer Sofian Jouini, which left my muscles sore, but my emotions liberated. At other times there was a Thai boxing workout led by a refugee and both refugees and volunteers even had the chance to become fashion designers for a day. 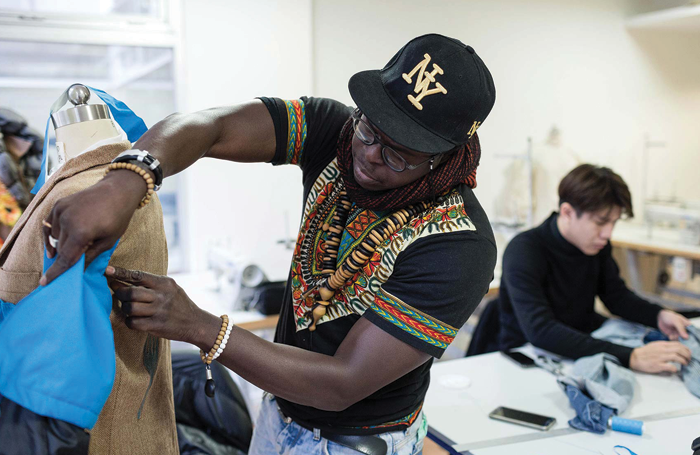 Good Chance had partnered with the International Fashion Academy in Paris, which sent students to work with refugees to create designs out of some of the weird and wonderful – but unusable – clothing donations the theatre had received. Many, including myself, had no idea about design, but as we crowded around a pile of fabrics one participant told me: “Just give an idea and make it happen.” It’s a line that sums up the spirit of the place. The week’s work at Good Chance built towards Saturday’s Hope Show, which takes a different form each week. When I was there it started with 30 of us in the centre of the space, workshop-style, showcasing different movement activities to the public. This was followed by open mic performances on a small stage, open to anyone who wanted a platform. The performers put on poetry, improvised rap, drumming and songs, and when it was over the dome turned into a dance floor. After the Hope Show, a refugee called Malang told me that Good Chance had brought happiness to offset the drudgery and frustrations of daily life as a refugee. Others said the theatre had given them hope for the first time since arriving in France. Across the week, the joy of connecting with people from all over the world was mixed with heartbreak and anger at their situation. It wasn’t like traditional volunteering; it was a cultural exchange through theatre, creativity and storytelling. It was not one way. I was enriched by the people I met and the work I helped create. It is so important that refugee stories will be given a platform in the West End with The Jungle, but I also hope that as many people as possible can experience what I did at Good Chance. The work there is by no means second-rate or simplified to accommodate people who may not have experienced theatre before. In fact it’s all the richer for the different perspectives at play and all the more truthful, as participants are not acting, they are expressing themselves. Good Chance does not pretend to have solutions to the refugee crisis, but instead uses theatre to offer respite to the people who need it the most, and suggests a way of working together that manages to bridge the gap between languages and cultures, providing a democratic space where anyone can tell their story.